Gilbert and George have been partners and collaborators since art school, when they studied sculpture at St Martin’s School of Art in London in the swinging 60s. St Martins at that time was a hub for new forms of sculptural practice, initially using readymade industrial beams. Within a couple of years this direction was overtaken by artists such as Richard Long who worked with landscape, documenting walks, arranging stones in geometric shapes in the environment or bringing them back to the gallery. Gilbert and George invented their living sculptures in 1969 while still at college and that year paraded through the crowd at a pop concert in Hyde Park. This was their first public artwork from the series ‘Living sculptures’. Among the crazed crowd on that sunny, stoned afternoon two black-suited men in bowler hats looked startlingly conservative – or they would have if their hands and faces were not glistening with thick gold paint. Gilbert and George later performed a similar piece at the AGNSW as a John Kaldor project in 1973. Gilbert and George still derive their inspiration from mingling with crowds, usually on the streets in London’s East End, where they live and work with gay youth and skinheads. Since the 1980s they have principally worked with photographic images which they enhance manually to make them more dramatic and they hope more accessible to a non-art audience: they insist on the accessibility of their art, which is presented in bright, graphic form like advertising and usually overtly sexual in content. They expose political and sexual behaviour that is part of everyday life in Britain but is not comfortably acknowledged in polite conversation. At first the ‘Living sculptures’ provided a way for the penniless students to make a splash without the costly materials needed for formal sculpture. This was as much a political position as an economic one. Gilbert and George’s house, which they still occupy in East London, is named ‘Art for all’ in a reference to the 19th-century designer William Morris and his utopian dream of a world that was permeated by art rather than materialism. ‘Reaming’ is typical of the way Gilbert and George make a kind of contemporary history painting. Their subject matter is drawn from the streets of London but the youths they feature take on the mantle of the heroic male model of European traditions. 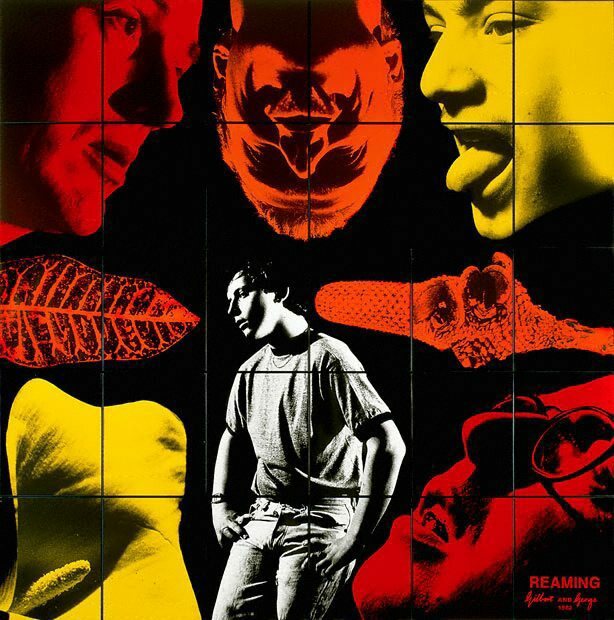 Gilbert and George confronted the gay sexual issues of their world in public when these subjects were usually private acts and seldom spoken of, except as scandal. They aimed to ‘unshock’ the public by confronting people with their images while making them as seductive as possible. Signed lower panel [dd], red paint ".../ Gilbert ... George/ ...". Not dated. Anthony Bond, Contemporary: Art Gallery of New South Wales Contemporary Collection , 'Imagining the body', pg.246-289, Sydney, 2006, 248, 262, 263 (colour illus. ), 432. Tony Bond, Look , 'The art of unshock', pg.19, Melbourne, Nov 2000, cover (colour illus. ), 7 (colour illus. ), 19 (colour illus.). Alejandra Szczepaniak, Look , 'The year of giving generously', pg. 22-23, Melbourne, Dec 2000-Jan 2001, 23 (colour illus.). Gilbert & George , Milan, 1996. Gilbert & George: The Complete Pictures 1971-1985 , London, 1986, 173 (illus.). Gilbert & George: the complete pictures , 2007. Gilbert & George , 2007. Gilbert & George , Paris, 1997, 162 (illus. ).